Everyone has a favorite dining spot, one that’s close to his or her heart and always opens the floodgates of memories past. One such place for me is Le Sélect bistro in Toronto, a place I used to go to any chance I had back in my adolescent Toronto days. Girlfriends, family, friends ... any occasion was just fine by me to pay this historic Toronto dining establishment a visit. Specialized in classic French fare, Le Sélect moved roughly ten years ago to its new, always downtown, Wellington street surroundings, after thirty years or so on trendy Queen Street West. There it was located in a ‘beyond cute’ little building and room, a room so small that the bread basket was located over your head (no, I haven’t been drinking) and you needed to roll out a rope tied to a hook on the wall behind you in order to lower the bread to your table. The new venue is much bigger (but frankly less charming), though one that nonetheless successfully screams out Parisian “brasserie”, with zinc bar, vintage French movie posters, and background jazz music in tow. Le Sélect continues to boast a very fine wine list (the old location used to be one of my favorite hunting grounds for high quality late harvest Alsatians, for example). In an example of just how closely restaurants are linked to fine wine, an old maitre/somm of Le Sélect, Rob Power, has since gone on to become winemaker and director at Creekside, one of Niagara’s most successful and ‘different’ wineries (in that it specializes in Sauvignon Blanc and Syrah wines, not all that common in Ontario wine circles). Chef Albert Ponzo and his team are in fine form (as always I dare say) on this night. 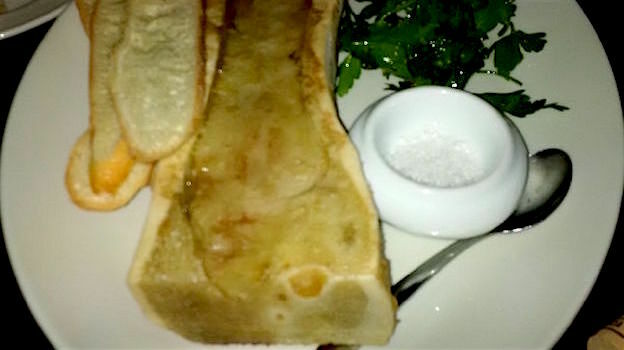 The bone marrow comes with a spoon so you can just slide the fatty bone interior onto warm toasted bread; perhaps not the healthiest of appetizers, but hey, when in France (er, Toronto), do as the French do. 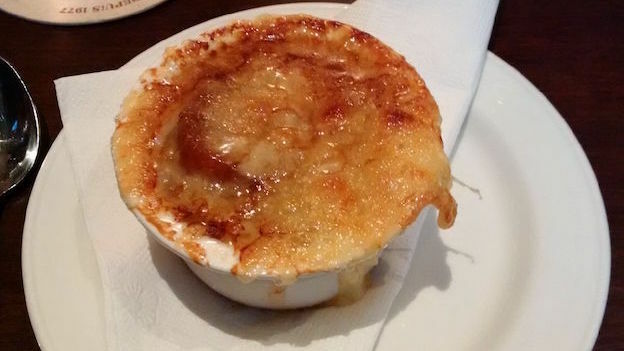 The onion soup is a throwback to days gone by, thick creamy and saline, with plenty of brown broth and caramelized onions. All it’s missing is a pair of scissors with which to cut through the melting Emmenthaler cheese. 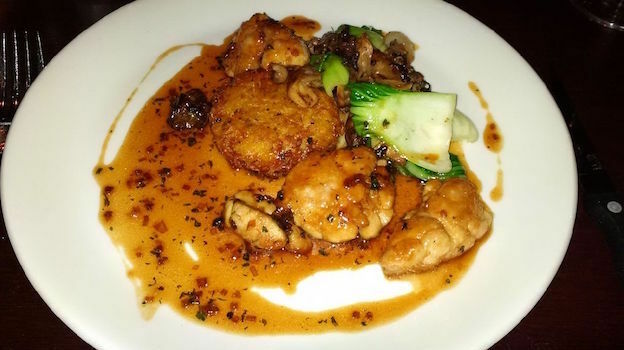 The sweetbreads are lovely, bathed in a Madeira sauce accompanied with a medley of mushrooms. I personally like my sweetbreads with a hint of something sweet, say a whisper of orange for instance, but these from Le Sélect are a splendid rendition. The black pudding is actually a crispy seared terrine with buckwheat, pulled pork and a red wine, Port and mustard sauce. I have to tell you, it’s even better than it sounds. As good and hearty as the food dishes are here (on another note of merit is that Le Sélect is committed to sustainable fishing and farming practices as certified by serious entities such as SeaChoice or the Marine Stewardship Council), the wines are more than their match. The restaurant wine cellar houses 1,200 different wines and about ninety-five beers, though on this night I was celebrating with an old friend and so we chose to bring in a couple of our wines as well. I started things off with the excellent 2010 13th Street Riesling Below Zero Niagara Peninsula, a pretty clean off-dry Ontario Riesling, and then moved on to the 2009 Schlumberger Gewürztraminer Séléction de Grains Nobles Cuvée Anne, quite simply the best wine produced by this estate in some time. An absolute knockout in its interplay of tropical fruit and sweet spices, but buoyed by vibrant, fresh acidity, this wine’s luscious but bright mouthfeel and relatively sweet nature combined magically well with the bone marrow, the onion soup and the sweetbreads. 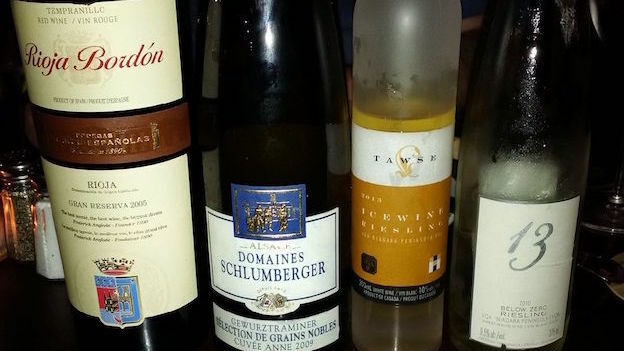 It’s a poster boy for just how well sweet wines can work with a whole meal, provided one chooses the right dishes. We had some aged cheese with the soft, very well balanced 2005 Bodegas Franco Españolas Rioja Bordón Gran Reserva, which is also an absolutely great buy considering the low price, the quality in the bottle and that it’s ready to drink. It spends 36 months in American oak barrels (you can tell) and offers heady, sweetly spicy creamy red fruit and smoky underbrush and vanilla notes by the buckets. I finished dinner off with the usually elegant Icewine from Tawse, though the 2013 Tawse Riesling Icewine Niagara Peninsula seemed a little lighter in style than some previous vintages. Nevertheless, it was balanced and precise, and though it offered luscious creaminess and sweetness in spades, it bosts so much acidity it finishes light on its feet, no small trick for such a concentrated wine. Le Sélect may offer memories of halcyon adolescent days, but the food, the wines and the ambience are very much rooted in the present, which turns out to be just as memorable as the many other moments spent here in years past.